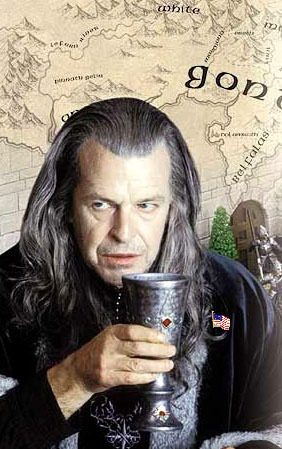 We start with Denethor, last Steward (lame duck) of Gondor, pretender to the throne, living in the White Castle, going mad after communicating with the dark side, and bringing his nation to the brink of ruin with an incompetent war strategy. I don't want to get too hung up on who are the partisan "good guys" and 'bad guys" with this metaphor. 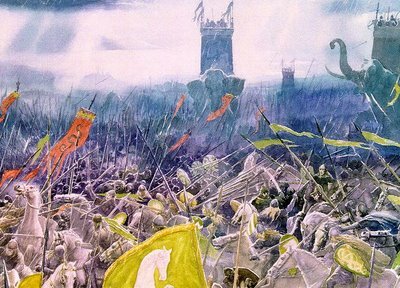 After all, men fought on both sides of the battle of Minas Tirith, some aligned with Orcs and Wraithes, some aligned with Dwarves and Wizards, just like you have Republicans and Democrats on both sides of this Executive vs. Legislative battle. Of course there were those "oliphaunts" on the Field of Pelannor which are metaphorically impossible to ignore, as well as a future king leading an army of the undead, who are paying penance for their treachery during a lost war fought decades before. Are you still with me? Keep in mind that this is a metaphor, not an analogy. There is no requirement for the Battle in the House of Representatives to exactly follow the plot line of the Lord of Rings. For example, unlike Tolkien's version, Nancy "Galadriel" Pelosi decided to go ahead and wear The Ring of Power in this version. Of course, she promised to do only good with the power, but despite being well beyond her self-imposed 100 hour initiative time limit, she has yet to take "the precious" off her finger. Ok, I have taken this far enough. A full Tolkien-esque acccounting of the Battle in the Field of the House of Representatives is left as an exercise for the reader. Much has been written about the battle in the MSM and the blogosphere, and we will not re-hash all that here. DWSUWF will be content to simply highlight a few speeches that caught our attention, and make a couple of observations. The two most thoughtful, non-partisan, and intellectually honest speeches in the House debate were by Republicans, one voting for the resolution and one voting against. Both are presented here. The membership is fond of calling the House of Representatives the People's House. This vote on the resolution critical of the escalation in Iraq is an accurate reflection of the concerns of the American electorate. A vote on this resolution would never have taken place in the previous Congress, but if it had, it would not have passed in the previous Congress. Here is one example of what has changed in Congress and why. "Melissa Hart is the good soldier who doesn't depart from President Bush's marching orders. She is glad that the administration is talking about a change in tactics, but gives no hint that Iraq was a mistake or a miscalculation. The job must be finished, she says, or else calamity will ensue." Compare and contrast with the perspecive of the congressman that now represents Pennsylvania's 4th District. Republicans have yet to pay attention to what really happened in 2006. Melissa Hart was a smart, competent and well liked Representative from a safe district. She lost. She confused being an apologist for George Bush's failed Iraq policies with being a Republican conservative. Representatives are exactly that - a representative proxy for the people in their district. Jason Altmire represents the Pennsylvania 4th district better than Melissa Hart. Too many Republicans continue to make the same mistake as Hart. They risk turning the Republican party into an ineffectual political force for a generation. We cannot have a divided government, if the major parties are not roughly balanced, and they cannot be balanced if the Republican party fails to acknowledge reality. We conclude these observations with one more Republican member of the House, whose arguments we found less than compelling. I am not sure if he accurately represents his district, but if he does, this is a part of the country I plan to avoid. Round 7 - Senate Cloture yet again. Senate Majority Leader Harry Reid dropped the failed Warner/Levin attempt at a bi-partisan resolution in favor of a Saturday vote on the House resolution. The partisan dynamic and the speeches on the floor were a replay of the cloture vote last week. In this vote the "gang of seven" Republicans voted with the Democrats supporting cloture, creating a majority of 56-34 in support. The measure still fell short of the 60 votes needed in the Senate to avaid a fillibuster and pass the resolution. Sigh - forget the LOTR metaphor. Lets try poker. Despite anyone's high-minded rhetoric, the debate over the escalation in Iraq cannot be seperated from politics and it is naive to think differently. Democrats outmaneuvered the Republicans on public perception of the debate in the Senate, and are holding a better political poker hand. There was no reason for Harry Reid to fold that hand. Either party could have yielded political posturing to get the debate and the vote. Republicans could have agreed to a vote on the bipartisan Warner/Levin resolution. They could have agreed to vote on the Resolution passed by the House. They continue to bluff with a losing hand. The Democrats could have agreed to an additional vote on the Gregg amendment. But the Democrats are winning the P.R. battle, so there is no reason to do so. Republicans were and are painted as obstructing an embarassing vote for the President. Call. The cards are on the table. The fact remains there was no vote and no real debate, but the Republicans took the blame. We'll call round seven a draw in the executive/legislative battle. Through 7 Rounds: Congress - 3, President - 2, Draw - 2. Technorati tags: divided government, Harry Reid, libertarian, Ron Paul, 2008 election, Jason Altmire,Jeff Flake, Iraq, Virgil Goode, Democrat, Republican, non-binding resolution, It's the war stupid. why did you cut ron pauls speech short? I did not record that video, but found it on youtube. I'll replace it with the full speech, once youtube gets around to processing it (two days and counting). We cannot have a divided government, if the major parties are not roughly balanced, and they cannot be balanced if the Republican party fails to acknowledge reality. Right there is the problem with your premise. You're operating on the assumption that the "division" is between democrats and republicans and that is a huge mistake. The divisions, at least for the sane and semi-sane, currently exist within the democratic party. The republicans are pretty much lockstep except on the issue of Iraq which has become so unpopular that a few are switching sides now. Frankly, 90% of the current crop of republicans are nothing but socially regressive loons. Having previously lived in CA I can understand where you're coming from, in some areas dems have "gone off the deep end" but there's this vast wasteland called "the rest of America" where that just is not the case. The "division" you say you are seeking exists between your "far left" dems and what I can only call "western dems". Unless you really are a "social conservative". Hagel may have a great stance on Iraq but his socially regressive control-freak tendencies and lockstep voting record with Bush other than on Iraq, disqualifies him from consideration. Might seem refreshing if one lives in SF but you're forgetting the rest of the country, we've had enough of it. The problem with Eric and Mama's argument: The case made for divided government by Slivinski, Niskanen, Ornstein, Levinson and others (see right sidebar), is based on historical fact using a specific definition of Divided Government. 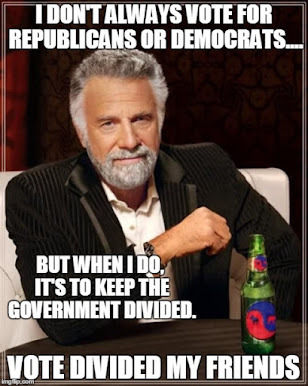 To whit: Divided Government occurs when the PARTY of the President in the Oval Office, does not have majority PARTY control in both houses of congress. Eric and Mama find this definition inconvenient for their party preferences, so they just make up a new one. It just doesn't work that way. 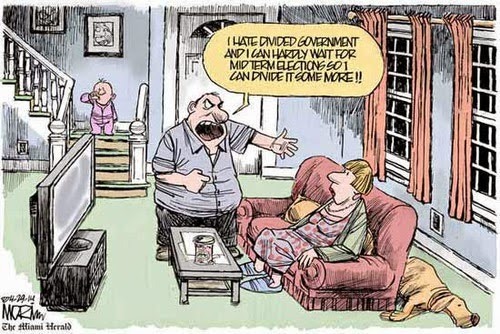 The documented benefits of divided government include restrained growth in spending, better oversight, longer lasting major reforms, fewer wars and better governance. The mechanism of why this works can be debated, but the reality is that it has almost nothing to do with political ideology of the party in the White House. It has everything to do with assuring that one party does not control both the legislative and executive branches. It has to do with the dynamic tension between the parties that results from shared power. My support for Hagel is derived from the fact that he is the most credible anti-war Republican. If he were to be elected President, the Democratic Congress would not permit Hagel to implement any of the Social Conservative agenda with which you (and I) disagree. My view is that there is one over-riding issue, and Hagel is the best presidential candidate who is on the right side of that issue, that will still result in a divided government past 2008. No big argument, we both believe what we believe so I'm not going to beat a dead horse :). Only comment is that my party affiliation is at least a little less strong than you might think. If I still lived in CA I can honestly say I would have voted for Ahhhhnold. There are some divisions within the republican party but very, very few at this time, the ultra-right machine has marginalized most of them. Could this happen with an all-dem government? Absolutely. Which is why having failed to find an even reasonably palatable candidate on the right I'm rooting for the furthest right (at least economically) from the left. If you do some look ups on NM you'll find even most republicans in the state are openly and heartily endorsing Richardson. Face it, this country has swung waaaay too far to the extreme right, I'm looking for a little moderation myself. I don't see Hagel as a force for moderation in any way, shape or form.